Freedom and Flourishing: Do emancipative values support economic freedom? What do I mean and why should you care? First, people tend to have happier lives in societies with strong emancipative values. As more countries have experienced economic development and accompanying improvements in material living standards, a rise in emancipative values has resulted in more widespread opportunities for individuals to flourish. Second, societies have a better chance of being able to sustain improvements in material living standards if their values support economic freedom. As discussed in my last post, there is evidence that the industrial revolution, which began the process of economic development, was influenced by a change in values toward support of economic freedom. The question of whether emancipative values support economic freedom is too big to answer in this post, but I can make a start. My search for literature relating to links between values and economic freedom led me to Gizem Arikan’s article: ‘Economic Individualism and Government Spending’ (WVR: 4(3),2011). Using data from the World Values Survey, the author tested whether countries in which values of citizens are more individualistic have smaller government (as measured by government spending as a percentage of GDP). She found that individualistic societies do indeed tend to have smaller government. She also found that the effect of individualism on size of government is more pronounced in societies with majoritarian elections and presidential systems (which I find very interesting, even though it is not particularly relevant to the present discussion). The study uses central government spending as its measure of government spending, but allows for the possibility of lower central government spending in federal systems by including federalism as a control variable. Other control variables include per capita GDP, the percentage of the population over 65, democracy, and institutional variables to account for majoritarian and presidential systems. The results are inconclusive on the question of whether high income countries tend to have big governments. The results are consistent with the view that an aging population tends to result in larger government, but suggest that democracy, majoritarianism and presidentialism all tend to reduce the size of government. The individualism variable used in the study incorporates values relating to: whether respect for parents should be conditional on their behaviour; ideal qualities for children to learn at home e.g. independence, imagination and feelings of responsibility; and qualities important in a job e.g. responsibility and opportunity to use initiative. There is not much direct overlap between Arikan’s individualism index and Welzel’s emancipative values index. The only components they have in common relate to desirable child qualities. While Arikan’s index focuses on values that relate fairly directly to individual autonomy, Welzel’s index has a broader focus, incorporating values relating to sexual morality (divorce, abortion and homosexuality), gender equality and voice (freedom of speech and democracy). 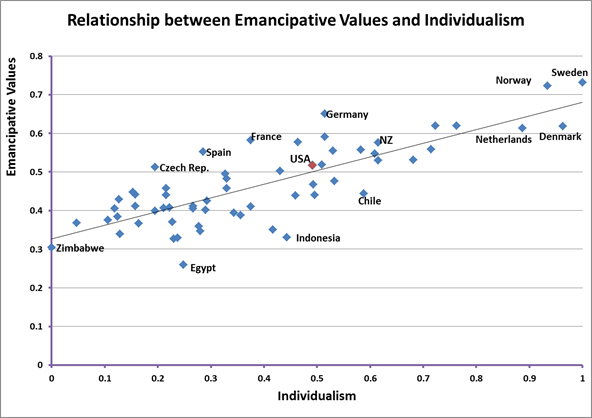 However, the chart below suggests that there is high correlation between Arikan’s individualism index and Welzel’s emancipative values index. The surprising observation in the chart is that the Nordic countries – normally thought of as prime examples of countries with big government - rank much more highly than the United States on both the individualism and emancipative values indexes. Does this mean I should reconsider my view of the US as the land of the free? Perhaps we can shed some light on the matter by considering the relationship between emancipative values and attitudes toward big government and competition.